The concept of tunable properties encompasses composite nanostructures whose physical properties can be controlled both reversibly and dynamically by the application of an external electrical stimulus. This is readily achieved using nanomaterials and nanostructures owing to their large ratio of interface-to-volume. The stimulus can be provided by various means, e.g. dielectric, ferroelectric, and electrolyte gating which induces an electric charge at the interface of the functional material leading to charge carrier doping (electric field effect) and thus to a reversibly tuned property change. However going beyond that concept, reversible ion intercalation (reversible electrochemistry), which includes ion transfer across the interface can also effectively alter the materials property. In between these two mechanism, reversible surface chemistry (redox pseudocapacitance), displays an effective tools to obtain sizeable surface charges. The different tuning approaches employed in the Tunables group are illustrated schematically in the figure below. The research focus of the Tunables group addresses the control of magnetic properties in nanomaterials. In the following some recent examples of reversible magnetic tuning employing the above introduced approaches are presented. Especially the large flexibility of the liquid gating approach allows for the use of a multitude of morphologies ranging from epitaxial thin films, over nanoporous thin films to nanopowders. The primary objective of our research is to establish scientific foundations enabling the design, fabrication and then reversible control of nanomaterials properties to explore their potential for applications. Electric field tuning of magnetism is one of the most intensely pursued research topics of recent times aiming at the development of new-generation low-power spintronics and microelectronics. However, a reversible magnetoelectric effect with an on/off ratio suitable for easy and precise device operation is yet to be achieved. We found a novel route to robustly tune magnetism via the charging/discharging processes of hybrid supercapacitors, which involve electrostatic (electric-double-layer capacitance) and electrochemical (pseudocapacitance) doping. We use both charging mechanisms occurring at the La0.74Sr0.26MnO3/ionic liquid interface to control the balance between ferromagnetic and non-ferromagnetic phases of La1-xSrxMnO3 to an unprecedented extent. A magnetic modulation of up to ~33% is reached above room temperature when applying an external potential of only about 2.0 V. Our case study intends to draw attention to new, reversible physico-chemical phenomena in the rather unexplored area of magnetoelectric supercapacitors. Figure: Sketch of the device and in situ measurement principle. The magnetoelectric coupling at ferromagnetic/ferroelectric interfaces in epitaxial La1−xSrxMnO3/Pb(Zr,Ti)O3 (LSMO/PZT) heterostructures was studied. The remarkably high lateral uniformity achieved in such films allowed for a ferroelectric device area of more than 6 mm2. This has enabled for superconductive quantum interference device (SQUID) measurements of the magnetic response to the systematically, completely in situ, varied remanent ferroelectric polarization. Temperature dependence of the magnetic modulation upon charging and the magnetic response to the ferroelectric stimulation indicate a field-effect dominated coupling mechanism and generally confirm the concept of electrostatic hole doping of LSMO. Figure: LSMO/PZT heterostructure and magnetoelectric coupling. (a) Transmission electron microscopy crossectional view of the LSMO/PZT heterostructure. 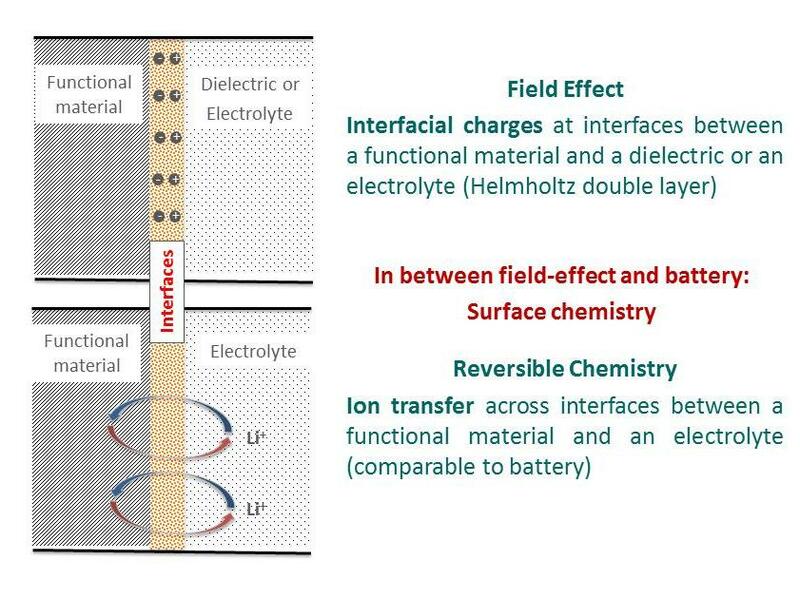 To go beyond the interfacial effects, intercalation-driven electrochemical approaches are proposed which can, in contrast to the field effect concepts, also be pertinent to bulk materials. The concept is demonstrated here for ferromagnetic iron oxide by a judicious control over the reversible lithium chemistry. The insertion of lithium ions results in a valence change and partial redistribution of the Fe 3+ cations in the spinel structure, thus yielding a large (up to 30%) and fully reversible change in magnetization at room temperature. Considering the availability of a large number of intercalation-friendly magnetic materials, ample opportunities for increasing the effect size towards a complete on-and-off magnetic switching can be foreseen, thereby paving ways for applications involving micro-magnetic actuation. Figure: Reversible modulation (~30%) of the magnetization of a Fe-oxide electrode by external voltage induced lithium ion insertion. Here a large and reversible change in the room temperature magnetization in strong ferromagnets is reported, with electrochemistry-driven Li-ion exchange; carefully chosen spinel ferrites demonstrate a reversible magnetization variation up to 50% for CuFe2O4 and 70% for ZnFe2O4. In case of CuFe2O4, the magnetization variation is predominantly associated with the preferential reduction of Cu2+ to Cu+ ions, and, hence, abides a nearly one-to-one relationship with the amount of injected Li-ions. In addition, the reduction of Cu2+ also annihilates the Fe3+==O==Cu2+ magnetic interaction, resulting in a marked decrease in the Neél temperature of CuFe2O4. In contrast, the electrical tuning of superexchange interactions is found to play the decisive role in ZnFe2O4, where the simple electrochemical reduction model of magnetic cations can only explain a nominal fraction of the total magnetization variation, and indeed an electrochemically controlled reversible change in transition temperature is found necessary to account for the large magnetization variation observed. Figure: Li intercalaction induced tuning of the magnetization of ZnFe2O4, resulting in a magnetic modulation of up to 70%. High-Performance All-Printed Amorphous Oxide FETs and Logics with Electronically Compatible Electrode/Channel Interface. Sharma, B. K.; Stoesser, A.; Mondal, S. K.; Garlapati, S. K.; Fawey, M. H.; Chakravadhanula, V. S. K.; Kruk, R.; Hahn, H.; Dasgupta, S.
Amorphous nickel nanophases inducing ferromagnetism in equiatomic Ni–Ti alloy. Chellali, M. R.; Nandam, S. H.; Li, S.; Fawey, M. H.; Moreno-Pineda, E.; Velasco, L.; Boll, T.; Pastewka, L.; Kruk, R.; Gumbsch, P.; Hahn, H.
Voltage-Controlled On/Off Switching of Ferromagnetism in Manganite Supercapacitors. Molinari, A.; Hahn, H.; Kruk, R.
Applying Capacitive Energy Storage for In Situ Manipulation of Magnetization in Ordered Mesoporous Perovskite-Type LSMO Thin Films. Reitz, C.; Wang, D.; Stoeckel, D.; Beck, A.; Leichtweiss, T.; Hahn, H.; Brezesinski, T.
Doping of nematic cyanobiphenyl liquid crystals with mesogen-hybridized magnetic nanoparticles. Appel, I.; Nádasi, H.; Reitz, C.; Sebastián, N.; Hahn, H.; Eremin, A.; Stannarius, R.; Behrens, S. S.
Structure and conductivity of epitaxial thin films of barium ferrite and its hydrated form BaFeO2.5-x+δ(OH)2x. Sukkurji, P. A.; Molinari, A.; Benes, A.; Loho, C.; Chakravadhanula, V. S. K.; Garlapati, S. K.; Kruk, R.; Clemens, O. In situ tuning of magnetization via topotactic lithium insertion in ordered mesoporous lithium ferrite thin films. Reitz, C.; Suchomski, C.; Wang, D.; Hahn, H.; Brezesinski, T.
A versatile apparatus for the fine-tuned synthesis of cluster-based materials. Fischer, A.; Kruk, R.; Hahn, H.
Magnetic properties of iron cluster/chromium matrix nanocomposites. Fischer, A.; Kruk, R.; Wang, D.; Hahn, H.
The power of in situ pulsed laser deposition synchrotron characterization for the detection of domain formation during growth of Ba₀̣₅Sr₀̣₅TiO₃ on MgO. Bauer, S.; Lazarev, S.; Molinari, A.; Breitenstein, A.; Leufke, P.; Kruk, R.; Hahn, H.; Baumbach, T.
Introducing a large polar tetragonal distortion into Ba-doped BiFeO₃ by low-temperature fluorination. Clemens, O.; Kruk, R.; Patterson, E. A.; Loho, C.; Reitz, C.; Wright, A. J.; Knight, K. S.; Hahn, H.; Slater, P. R.
Large magnetoresistance and electrostatic control of magnetism in ordered mesoporous La₁₋ₓCaₓMnO₃ thin films. Reitz, C.; Leufke, P. M.; Schneider, R.; Hahn, H.; Brezesinski, T.
Ordered mesoporous thin film ferroelectrics of biaxially textured lead zirconate titanate (PZT) by chemical solution deposition. Reitz, C.; Leufke, P. M.; Hahn, H.; Brezesinski, T.
Thermal and photoinduced spin crossover in a mononuclear iron(II) complex with a bis(pyrazolyl)pyridine type of ligand. Salitros, I.; Fuhr, O.; Kruk, R.; Pavlik, J.; Pogany, L.; Schäfer, B.; Tatarko, M.; Boca, R.; Linert, W.; Ruben, M.
In situ magnetometry studies of magnetoelectric LSMO/PZT heterostructures. Leufke, P. M.; Kruk, R.; Brand, R. A.; Hahn, H.
Room temperature reversible tuning of magnetism of electrolyte-gated La₀̣₇₅Sr₀̣₂₅MnO₃ nanoparticles. Mishra, A. K.; Darbandi, A. J.; Leufke, P. M.; Kruk, R.; Hahn, H.
Ferroelectric vs. structural properties of large-distance sputtered epitaxial LSMO/PZT heterostructures. Leufke, P. M.; Kruk, R.; Wang, D.; Kübel, C.; Hahn, H.
Tuning properties of nanoporous Au-Fe alloys by electrochemically induced surface charge variations. Mishra, A. K.; Bansal, C.; Ghafari, M.; Kruk, R.; Hahn, H.